England manager Gareth Southgate has got himself involved in the potential transfer saga involving Chelsea wonderkid Callum Hudson-Odoi amid links with Manchester United. The 18-year-old has enjoyed a fine breakthrough season for Chelsea this term, though it’s widely understood he wants more first-team opportunities. Linked with Bayern Munich in January, it now looks like Manchester United are reportedly joining the running for Hudson-Odoi this summer. 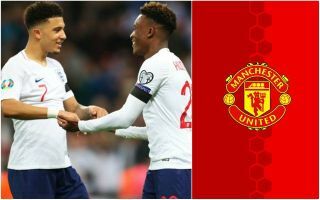 The England international could well get more opportunities at Old Trafford, with United, particularly under current manager Ole Gunnar Solskjaer, more well known for trusting and developing young players. Both he and England team-mate Jadon Sancho have been linked with United as they eye new attacking players to replace Alexis Sanchez, but Southgate has suggested the teenager should stay at Chelsea. ‘If you look at number of appearances, he has actually been on the field quite a lot,’ said Southgate. ‘And I know from when we were talking with the club earlier in the season how much faith Maurizio has in him. He has got some outstanding players just in front of him but he’s slowly getting more and more game time. United will surely still feel they can persuade Hudson-Odoi to quit Chelsea as he stalls over signing a new contract, with his current deal due to expire at the end of next season.